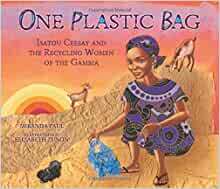 In the book, One Plastic Bag by Miranda Paul Grandmother and Isatou tries to stop the plastic bag problem by making the plastic bags into purses. Also the purses were very helpful to Isatou, her friends, and especially grandma. We also watched a “Ted Talk,” it was about getting rid of plastic bags. There were two sisters, one named Isabel Wijsen and one named Melati Wijsen. They made a whole team. This shows that we have to save plastic bags and be more careful because that will make the Earth more safe from plastic bags.